This joint woodlands project started in 1998, with co-operation between Ardroy Outdoor Education Centre, Loch Goil Community Trust, Loch Goil Primary School and Forest Enterprise Scotland who own the original 20.3-hectare (50.2 acres) northern section of Atlantic Oak Woodlands. Formal agreement was reached with Forest Enterprise Scotland for the partnership to be responsible for managing the woodlands to improve their bio-diversity and also to develop them as an education resource. 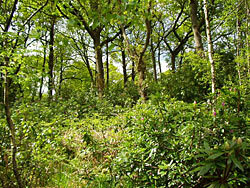 Manage the Atlantic Oak Woodlands in a way that enhances the variety of habitats. Develop the area as an education resource for teaching environmental concepts, introducing people to traditional woodland crafts. Help people appreciate the ‘magic’ of woodlands. The woodlands are accessed from the car park G.R. NS 196 975. Argyll & Islands Enterprise (A.I.E.) provided funding for both stage 1 and 2 of the project. The Cormonachan Woodlands Association since 2015 manages 58.9 ha (145.5 acres) of Cormonachan Woodlands from Clach Bhadach in the north to Upper Cormonachan and Cormonachan Burn in the south.